Well, I promised a point to those early posts about our grand lodgings here in San Francisco, and it seems my day of reckoning is at hand. The trouble with beating around the bush for a month is that sometimes, in the business of living, you realize your original impression and intended "point" were not precisely right. You find that maybe you should have taken some time before drawing (and worse, promising) a conclusion. beauty of this place. Yet, quite honestly, it left me uneasy and wound up—the way I might feel wheeling a triple stroller though a narrow-aisled crystal factory. Our son Patrick hated the place right off the bat. Victorian gables and elaborate furnishings suggest haunted houses to little boys, and he would not so much as walk from one room to the next by himself for a full month. Now according to thirteen-year-old Agnes, there are two subjects Mommy is obsessed with and raises whenever possible—the importance of choosing a good husband (if they are one day called to married life) and the perfection of small houses. My speeches on husband selection usually take the form of pointing out potential “red flags” to keep in mind for the future, red flags being things like nose piercings, pink hair, unnerving tattoos, smoking, excessive drinking, sullenness, dishonesty, tax evasion, bad manners, a criminal record, boorishness, reckless driving, reluctance to hold doors, soup slurping, and a seemingly bottomless list of other quirks and foibles I do not wish to see in a son-in-law. This was the point I was planning to reach in those first few posts, and I probably would have attempted to make it more delicately were it not for everyone’s complete and utter change of heart. So you see my dilemma? I was trying to come to a point based on my daughter’s feelings over a month ago, and experience appeared to have taught her the complete opposite. Moreover, she had uttered my own unspoken thoughts as well. I would be lying if I did not admit to loving every inch of this place, each tasseled curtain and soaring ceiling, the front stairs, the back stairs, and all five glorious mantels. Even the reluctant Patrick has his favorite nooks and corners, perfect for pitching sheet tents or establishing imaginary zoos in which he is the naturalist in charge of all exhibits. Mulling things over afterward, I realized what had happened, relieved to find the “point,” though off shivering in a silken-tasseled corner, still remarkably intact. No house could make us happy--WE had made the house happy! We did not love this place because it was opulent. 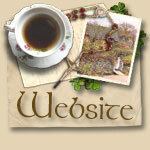 We loved it because we had begun to fill it with family history and memory. It was no longer a looming, antiseptic, untouchable museum, but a living, breathing bower of light and life. It would forever be the fairgrounds for Margaret’s nightly “baby romps” and theatre for Agnes’ loving readings of Romeo and Juliet. It would form the backdrop in our minds for Maureen’s historic penny swallowing, Eileen’s first birthday and her triumphant maiden voyage up a full flight of stairs. In six weeks time, we had inflated this house with our laughter, sprinkled her with tears, affronted her through tiffs and tantrums, and impressed her with our lofty thoughts. We prayed many a Rosary wrapped in her embrace and transformed her trim gilded gables into steeples for the Domestic Church. It is the family that finds its own measure of contentment, joy, and sorrow wherever it may be, and I hope the children will come away remembering this new adage: “Be it ever so humble--or extravagant--there’s no place like home." A day or so ago, I shared the story of our evening in downtown San Francisco and the homeless woman who spoke so lovingly to our son Patrick. Little did I know then that we had already become the victims of a petty crime. 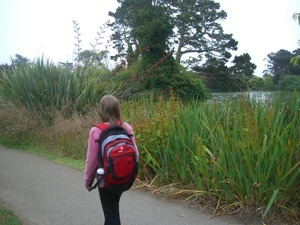 Our daughter, Margaret, has a backpack she takes with her everywhere, so much so that we joke about it being the quietest member of the family. Rescued from a friend’s “things to give to charity” pile several months ago, her black backpack was the only thing she brought from New York to San Francisco, its zippered coffers brimming with origami squares, souvenir pennies, snippets of ribbon, self-authored comic strips, Sacajawea dollars, stiff cardboard dolls, and other Useful Things. 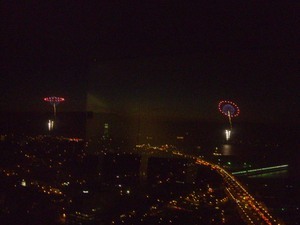 True to her faithful practice, Margaret had the pack with her the night we joined Daddy downtown for the fireworks. Dutifully leaving it in the car at my request, she did not even think of her beloved backpack until we arrived home many hours and one cable car ride later. The next morning, we piled into the van to head to Golden Gate Park. 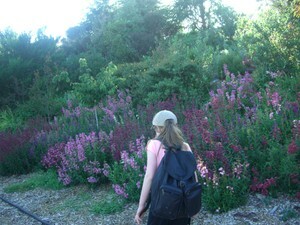 To Margaret’s dismay, the beloved backpack was not on the seat where she had left it. She begged me to check inside the house, and I conducted a diligent search, but we knew for certain we had never brought it in. I called Daddy as our last ray of hope, but he confirmed what I already suspected—the backpack had been stolen. As you might imagine, Margaret was devastated when I broke the news. Her face turned a dismal white, then a heartbroken shade of pink, and she sobbed, long, heaving, cries of despair and disbelief. Each moment brought a new remembrance of some trinket or treasure lost—the compact from Aunt Jenn’s wedding, a paper doll skirt made for her by Katie Barrett, the scissors Grandma mailed from New York. Trifles to all the world, but Margaret. My mind wandered back to a time in the eighties. 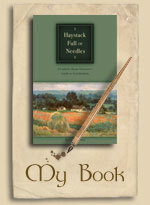 I was a freshman in high school and had my first real pocketbook, a blue and white striped cloth shoulder bag. It was jammed full of all my worldly possessions—a battered hairbrush, a velcro wallet stuffed with photos of classmates, a wedding photo of my parents, a black and white Woolworth’s shot of myself with my father (taken when I was still young enough to have blonde hair), a Pacman key chain, expired lift tickets from a memorable ski trip, a John Lennon button. It was all gone—stolen from my side at a fast food restaurant. How I mourned for it, shedding bitter tears over things with no value to anyone but me. Margaret was still crying and receiving words of consolation from her sisters when I pulled into the local shopping strip. We were on our way to the park, and bagels and coffee were in order, theft or no theft. Margaret grieved for each item as she remembered it: her Klutz Paper Fashions (a year’s worth of labor, lovingly organized in a bright red binder), her four-colored pen from the San Francisco Zoo, her mechanical pencils. I left Agnes and Theresa in charge as I quickly ran in to place our order at Noah's. Standing by myself in line, I pondered the circumstances, realizing that pain and disappointment are a part of growing up. There is not very much a mother can do to avoid sorrows for her child. Life can be difficult at times, and we all need to learn it sooner or later. By the time I stopped thinking about those Sunshine Family "twins," I was on line at the "5 and 10" next to Noah's. In my basket was a set of sparkly pens, a star-studded binder, sheet protectors, watercolors, glue, scissors, origami paper, stickers, colored pencils, and one spang new red and white backpack. (I had already run into the adjacent bookstore for Klutz Paper Fashions, snapping up the last set with glee.) Life would have its disappointments for Margaret, and there would not be a blessed thing I could do about them, but on the morning of July 5, 2007, there was still something I could do, and I would do it--with a glad and grateful heart--just as my own mother had thirty years ago (and perhaps a bit more recently too). How very true, Margaret. How very, very true. 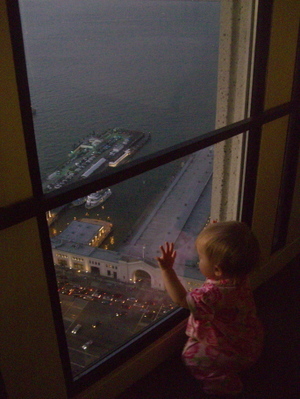 Fourth of July of 2007 turned out to be the most memorable of our lives, thanks to an impromptu invitation from Daddy, the kindness of a cable car conductor, and a homeless woman who reached past her storm cloud of anxiety and confusion to shed a single ray of sunshine upon my little son. From a window-lined conference room in the soaring building, we kept our sunset vigil, watching cars and crowds plodding toward Fisherman’s Wharf like a red-candled procession. In the last faltering rays of sunlight, Alcatraz became a ghostly battleship, its one bright eye blinking a warning through the mist. Suddenly, twin rockets spun like sparks from a blacksmith's anvil, beginning the show and delighting the children for over an hour. Back on the sidewalk afterward, the City that has been home to us for a month was teeming with people and shining more brightly than the fireworks. Although it was close to eleven, the night seemed young and somehow unfinished. 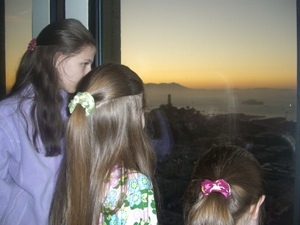 Daddy suggested I take a few of the older children to ride home on a cable car. The bounding enthusiasm of the girls made this idea a difficult one to thwart, and, quite honestly, I had been wanting to ride the cable for quite some time, so it was decided. Eileen was snug in a Baby Bjorn carrier on my chest and would come along, as would the four older girls. Daddy would drive the van home with Patrick and Maureen. Looking down at Patrick, who had not yet understood what this would mean for him, my heart went out to him. 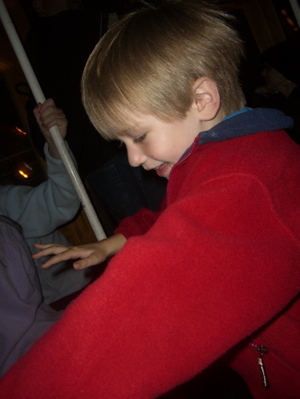 How could we leave the wheel loving-est member of the family out of our first cable car ride? “I’ll take him along as well,” I decided, leaving Daddy duly impressed. He scooped up Maureen for one last wave goodbye, and the rest of us hopped on board. Sitting on the inside of the car, the girls scrambled to find the best seats and vantage points. Riding a San Francisco Cable Car is like stepping back in time, the varnished wooden seats and wainscoted walls a relic of a bygone era. Patrick huddled by my side, his beaming smile and sparkling eyes showing what a shame it would have been to leave him behind. Our family sat in a row on a long bench, the passengers on the other side of the car smiling at baby Eileen, who was taking in her new surroundings with solemn blue eyes. The conductor came around to collect the fare, five dollars per rider. I had my thirty dollars ready and passed it to him, but he pointed to Patrick saying, “five and under are free” and attempted to return a five dollar bill. "He is five already," I told the man, expecting him to move on. Inexplicably and very kindly, he passed back twenty-five dollars saying, “I’ll just take five for all six of you.” The row of passengers opposite, locals with cable car passes, murmured, “How nice,” spontaneously applauding and raising a chorus of “Happy Fourth of July” to the children. I smiled back, marveling at the City of San Francisco, feeling as if we had wandered into some sort of urban utopia. The woman turned in her seat to glare at me, as if I had been interrupting. “Nobody ever listens to me!” she shouted. “Nobody cares! 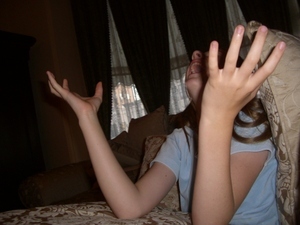 Nobody listens!” “Oh, excuse me,” I said, weakly, “I was listening, but I was afraid my little boy would . . . .” “Nobody ever listens!” she cut me off, pulling a white hood over her head so that it almost covered her eyes and leaning forward to rock back and forth. “You are going to push me over the edge, you and all the rest of you! You don’t care! Nobody cares!” The passengers opposite kept their eyes trained out windows and in books, the natural human response when closed in with an erratic person. Rattled by her display, Patrick cuddled up a bit closer to me, so that there was room for a person to sit between himself and the woman. A wave of passengers clambered in at a stop. “Look at them all!” she sobbed, still rocking. “ I guarantee not one of these people will be willing to sit down next to me! I’m clean, but not one of them will sit here! Not one of them will sit next to me!” With that, Patrick, who had been clinging to me, relaxed a bit, inching ever so slightly toward her. He gingerly pushed my shawl into the empty place as if trying to fill up the seat. She noticed the shawl out of the corner of her eye and stopped rocking. “You are trying to fill up that seat, aren’t you young man?” He did not answer but looked back at me. She continued, her face and tone suddenly serene, “You don’t want me to be alone, do you?” The entire Cable Car held its breath, and a few eyes even peeped up from books. “Thank you,” she murmured,“thank you young man, for showing me some love.” He did not look away, but listened unblinking. “Young man,” she continued, her poor withered face wreathed in smiles, “you showed a woman named Roxanne some love tonight and gave her hope. You are a fine young man, and do you know why you are such a fine young man?” Speaking now for the first time, Patrick softly whispered, “Why?” “Because,” she said, “you have a good mother, a mother who teaches you not to look down on anyone.” Hearing her response, Patrick turned his head back to me, and from the depths of his innocent little heart he said, “I love you, Mom,” planting a kiss on my cheek. Several “awwwws” from the other passengers were audible, and Roxanne beamed approvingly as the cable car ground to a halt. “Thank you, young man, thank you!” she repeated, rising and stepping toward the exit. The girls called after her, “Happy Fourth of July,” as merrily as if she was packing to leave a picnic, and she replied in kind, “Happy Fourth of July!” knocking on the glass behind us for a few more waves. As the cable car rumbled on, we could see her staggering from the street to the curb, almost too impaired to make the step. “Foxes have dens and birds of the sky have nests, but the Son of Man has nowhere to rest his head.” Matthew 8:20. “’Amen, I say to you, whatever you did for one of these least brothers of mine, you did for me.’” Mathew 25:40. Jesus not only did not look away from people like Roxanne. He sought them out as companions and friends, living among them and asking us to do the same. Our trip completed, we bid farewell to the cable car operator, setting out for home still chattering about the night’s excitement. In the distance, a tall man carrying a toddler wrapped in a long pink poncho was walking toward us, the steep terrain no hindrance to his steady, quick step. And the children sprang up the hill to meet their father. We woke from our Midsummer Night's Dream to find ourselves approaching the end of May without having taken a single Nature Walk or, other than our Marian May Baskets, completed any of our planned Marian Crafts. With a few days left, we hope to make up for lost time and began yesterday with a long walk through our favorite local gardens (the place that was the setting for our final performance of A Midsummer Night's Dream last week). 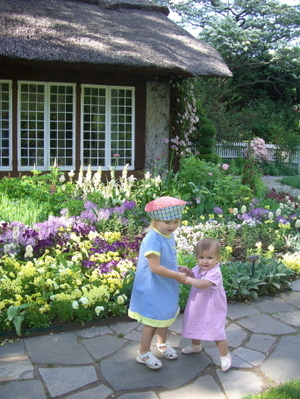 Here Maureen and Eileen frolic in front of our dream thatched cottage--it is not our own, but we love it as if it were. It did my heart good to nurse Eileen at a bench, breathing in the wild bouquet of lilacs, watching red-winged blackbirds, flashing fish, and romping, happy children. 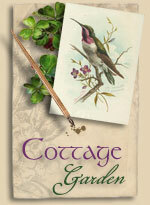 Margaret discovered that the unassuming purple flowers dotting the lawn look like fairies' teddy bears. 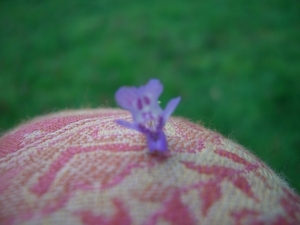 This little fellow rests on my new pink shawl. According to Agnes, the shawl is "the springtime equivalent of the Irish Walking Cape." How many more chances will I have to see my older two girls holding hands? This photo seems the perfect symbol of a family growing up--with the older ones setting out toward a bright future and the younger ones not far behind. 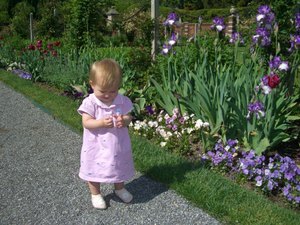 How is it possible that a little one who was not even born this time last year could trot all over the gardens with us, looking like some pale purple blossom freshly sprung? Slow down, Time, slow down! Let me tarry a while here in this place with these children! Blessed be thou, fair, sweet May! We were already a quarter of an hour late for the Andre Rieu Concert when we made our way through security and past the great glassy doors of the Nassau Coliseum. Now face to face with the snack bar (after leaving home without dinner), the sports-fan fare of popcorn, peanuts, and pretzels was irresistible. “OK,” I said, widening my wallet to reveal a twenty dollar bill and a couple of other singles. If I could paint a picture for you of the look on that man’s face, you would see before you the personification of human kindness, empathy, joy, and relief. He was beaming and thanked me heartily. It was only then I realized the poor man had been waiting anxiously, dreading the possibility that he might need to take back a water or a pretzel from that thin cardboard box. We found our seats—mercifully on the aisle—with the concert already in full swing. Andre Rieu and his vibrant young orchestra, oddly out of place in the drafty sports arena, succeeded in warming it to the rafters. The girls were captivated, but there was one young one even more appreciative than my four. A small boy with Down’s Syndrome three or four years old—impossibly cute in a long-sleeved plaid shirt—sat two rows in front of us. He kept time to the music with his hands, thrilling to every note. Putting an arm around his father, he received a prompt kiss, before turning to smile toward the couple in the row behind him. I watched that boy a long time, wishing—and this kind of thing never occurs to me with so many of my own—that he was sitting with us. My lap was strangely empty, and there was something undeniably compelling in his gestures and expression. I was not the only one who noticed it, for he had a circle of fond admirers round about him—not only his family, mind you, but smiling concert goers whose pleasant faces and hearty waves showed how their night was brightened by his unspoiled delight. Intermission came, and, with the lights turned up, the girls began scrutinizing the aisles and floor of the arena, searching desperately for their two grandparents. We had found out earlier that day that Gram and Pop would be at the concert (just by chance—we hadn’t planned it). I warned them a sighting would be highly unlikely given the enormity of the crowd, yet somehow we managed to spot Gram who was wearing red. If you could mount an enormous Buccaneer ride in the very center of the Coliseum and set it rocking at full tilt, we would have been at one high point on the arc, and my in-laws would have been on the other. 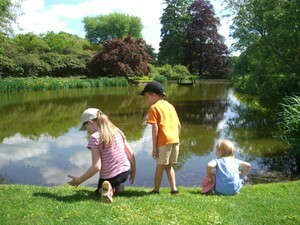 The moment they spotted Gram, the girls were elated, adding, “Look, there’s Pop! He’s coming back with coffee!” Even from that impossible distance all four reflexively waved and smiled, stretching high up in their seats in hopes of being noticed. What is it about grandparents that can turn a cold and crowded Coliseum into a familiar living room? One sight of Gram and Pop and four Heidis begged to be allowed to descend to the deep valley and scale the Alps to pay a visit to the Grandfather and Grandmother, eager and determined as if bent on delivering an apron of fresh-picked flowers or sack of soft white rolls. Unfortunately for my high-spirited lasses, their mother was on hand to play Fraulein Rottenmeier, making short work of the plan, yet I smiled to witness their deep love and affection. All too soon, the concert hummed to a close. Andre Rieu, as is his custom in every country he visits, played a final selection meant to capture the essence of the place and its people. At the first strains of “America the Beautiful,” the crowd was on its feet singing in one voice, in a tone at once insistent and proud, “America, America, God shed His grace on thee.” A bagpiper entered blasting the first throbbing notes of Amazing Grace and, instantly, thousands of people who had just faced the new American reality of stadium security checks, remembered our firefighters, police officers, and soldiers. This homegrown hymn breathed through old world lungs spoke its wordless message of Brotherhood, Hope, and Longing. In two simple selections, Andre Rieu had grasped the American Spirit—the immortal soul of a faithful people. Making our way out through the crowd, I was already reflecting upon the good people blooming all around us like blossoms bursting forth from a garden well-tended—the man behind the counter, that happy little boy and his admirers, our Gram and Pop, and Andre Rieu himself—who with bow and fiddle and bagpipe had pierced through to reach the all too often hidden heart of a nation. With these thoughts still playing in my mind, I turned the key in the ignition and put our van in reverse, wondering for the first time how I would escape from the tight spot in that unceasing flow of traffic. Before I had even a moment to wait, a white-haired woman in a sedan paused and waved me on with a friendly smile. “What a nice woman!” I exclaimed to the girls, turning my wheel instantly and flitting to freedom as readily as a boy who hears the final bell at school. Raising a hand out my window, I waved the driver’s salute of gratitude, offering up a heartfelt and heart-lifting prayer of thanksgiving for all the flowers strewn in our path. As you know, the Little Flowers close of season party is next week, December 11th. It was originally scheduled for 2 pm, but I've decided to move it up to 1 pm to get the most of the daylight. It's supposed to rain, unfortunately, but the children wouldn't really be able to play outside in the cold anyway, so we will not postpone. The theme of the party will be "Our Lady of Guadalupe" because her feast is the next day. A wonderful craft and activity are planned, so I hope you will all try to attend. The weather is icy and rainy. I briefly consider calling off the party at the last minute, but hesitate to postpone with Christmas coming. The party is in full swing. [MacBeth and her family visit for the first time--she and I hit it off instantly.] Brigid O'Neill brings cappuccino bars--a special treat for her coffee-loving hostess. The children enjoy creating Juan Diego paper dolls and pose for a group picture near a Guadalupe banner painted by my friend Lorraine and her children. Emily O'Neill, Brigid's seven-year-old daughter, appears on the right, wearing a white turtleneck and dark jumper. The place is a mess! Brigid, who normally leaves promptly at 4 pm, has stayed behind to clean up. When she finally gets four-year-old Danny and seven-year-old Emily into the car, she returns to say goodbye, making the observation, "It's viciously slick out there!" The family leaves, beginning the Rosary, as is their usual practice. The moment the house is empty, I make a quick phone call to Lissa in Virginia, leaving a message on her machine saying, "This was such a great party! I really wish you'd been here!" A speeding eighteen-year-old's car flips across the divider on the Meadowbrook Parkway, landing on the hood and roof of Brigid's van, before overturning his SUV more than once. The crushed roof narrowly misses the heads of the two small children strapped in the back, barely grazing little Danny. Emily has the presence of mind to unstrap her young brother and drag him out a broken car window to safety. She stands next to her grievously injured mother in the pouring rain, refusing to leave her side. Brigid's mother calls with the news. She does not have any details except that Brigid is in critical condition and the children are well. The other driver was able to walk away from the accident. Brigid's husband is on his way to the hospital. I call Lissa and leave another message very different from the first. Brigid O'Neill was in a very bad car accident this afternoon. She is in critical condition, unconscious, in ICU. The children are fine. Just in time for Christmas, Brigid squeezes her husband's hand on command, in his words, "the best Christmas present ever." A saintly woman from Westchester contacts us asking to take the pilgrim image of Our Lady of Guadalupe to Brigid's bedside the following Sunday at 3 pm, "The Hour of Mercy." Patty B. brought the Image of O.L. of Guadalupe to Brigid today, and it was just beautiful. Tracey and Elizabeth were there when we arrived, and afterward we were joined by Dan, Brigid's mother and father, Mary Anne, Kathleen, and Patrice. It was very moving. The image was huge, over 6 feet tall. Patty told us all about the miraculous healings and conversions associated with this particular image, and then offered to bring it to Brigid's children . . . . [I]t was dark and the snow was coming down fairly hard, but Patty insisted on bringing the image inside my house before she left. 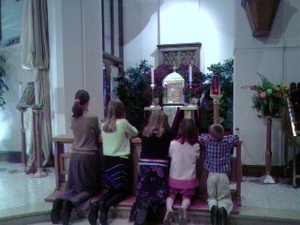 My children were each able to kiss Our Lady and kneel before her to say the Memorare. You can imagine how blessed I felt, especially because Brigid's wonderful parents were there as well. Brigid's father actually took pictures of my family with the Image! It was incredibly special. Now I just hope Patty made it home tonight in the snow. When I expressed my concern, she smiled and replied calmly, "How can I not be safe when I have Our Lady with me?" I guess we've found ourselves yet another saint. The pain and suffering, joy and hope, along the road to recovery is Brigid's story to tell, and I cannot begin to do it justice. These years haven't always been easy--not by a long shot--but she is with us, and her children have their beautiful mother back again. 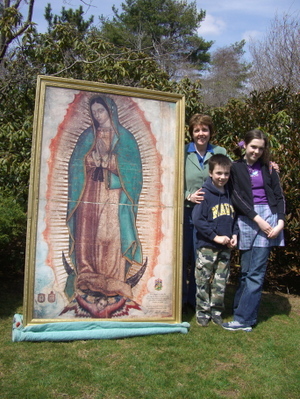 I would like to offer the Missionary Image of Our Lady of Guadalupe to the IHM moms. Easter Wednesday is the only available day left. . . . . Can you offer a suggestion for where we all can meet for a couple of hours, somewhere halfway? 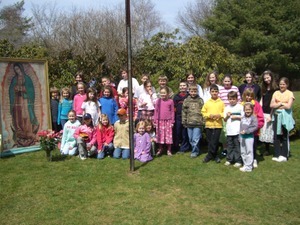 It just so happens I am already scheduled to host the first day of Little Flowers on Easter Wednesday. I gratefully accept her offer, requesting that she bring the Image to my house. At the end of a grace-filled day, I take another group shot. This time Emily stands third from the right in the back row. 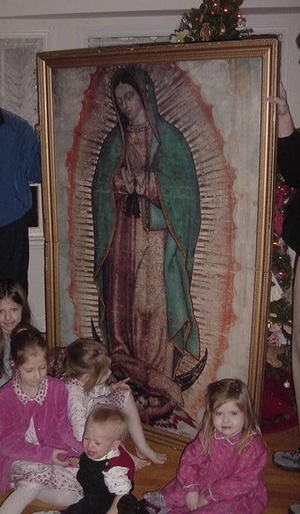 Many of those tall young ladies were little ones in the original Guadalupe photo, and some of their younger brothers and sisters--babies back then--now stand alongside them. Time marches on. Somehow, it seems, Our Lady has brought us full circle, continuing to ask, in her words to St. Juan Diego, "Am I not here who is your mother?" Yes, she is here. She has always been here, standing by our side as faithfully as that little girl in the rain. May we never cease to thank our Mother--the Mother of Mercy--for the gift of Brigid's Life. This Timeline of Mercy is dedicated to Miss Emily O'Neill, on the occasion of her twelfth birthday, which happens to fall--not surprisingly--on Divine Mercy Sunday this year. “Sweet Sacrament, we Thee adore! O make us love Thee more and more! Thy goodness Jesus would I sing! “Wow,” she breathed, poking a thoughtful thumb into her mouth to drink it in. [Yes, dear friends, like her mother before her, our precious Marie is a thumb sucker, particularly when she is mulling something over.] She sat quietly pondering as her sisters began again, relishing the sound of their own voices in a hymn worthy of the Seraphim. Weeks passed, and our long-anticipated Easter Pageant rolled around. After one of the performances, Marie was asked to rehearse the song along with the other communicants. A jumble of children tumbled into three standing rows—an adorable hodgepodge of tall and small, sharp and scruffy, calm and clamorous--boys and girls with eyes and hair and faces of every description--some from Mass-going families and others who may find themselves inside the Church but rarely. “So far surpassing hope or thought?" Something perceptible and heartfelt had taken root in all of them, no mistake. Understandably impressed and not a little bit surprised, the musical director blurted after one round, “You are the best First Holy Communion singers I have ever had!” The children gladly began the hymn once more, their second rendering no less heartfelt than the first. This time, the director could not help but wheel about, hoping to find some adults catching this singular performance. Most of the moms were chatting in clusters, but I stood watching with a broad smile on my face, and she made a beeline toward me. “I don’t know,” she said, still beaming toward the children, “maybe,” before slipping back to the front to cheer on her little band of singers. 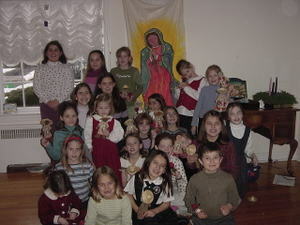 Our Lord’s lambs were right there before me and populating the First Holy Communion group. There they were, frisking and frolicking and kicking up their heels, having just been fed the hardy grasses of Truth and Beauty. I can only imagine how vibrant this flock will be when nourished by the Bread of Angels. It seems to me that too often we choose over-simplified little ditties for young children, as if perk and pep would stand in for substance. 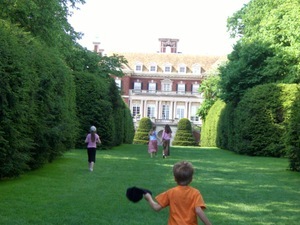 For seven and eight year olds, insipid, shallow strains hold about as much spiritual significance as “I’m a Little Teapot.” But give them Truth articulated in rich and beautiful language, and their ready hearts soak it in like well-tilled gardens in April. Young though they are, children are eternal beings made in the image and likeness of God, longing—no living--to know Him. The question, “Jesus, my Lord, my God, my all, how can I love Thee as I ought?” is a challenge for all eternity and an aspiration that cannot be embraced too soon. It is the battle cry of the saints. I am looking forward to the blessed day on which my fourth young one will receive Jesus in First Holy Communion, and I cannot wait to hear those precious lambs singing their hearts out once more—this time lit from within by the True Presence of Our Lord Himself. Complete Lyrics to "Jesus, My Lord, My God, My All" by Father Frederick William Faber. This post is lovingly dedicated to our beloved "Papa," Pope John Paul the Great, on his second birthday in Heaven.